Yesterday I featured handcrafted chairs, furniture in which to sit. 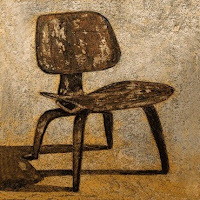 Today's topic is the chair used by talented Etsy artists as subject matter in the painterly, ceramic and photographic arts. One of these selections depicts the artist's playful flight of fancy, and the others invite the viewer to imagine the story. The chair is a familiar object that generally provides comfort and style, or in some cases evokes anxiety (the "hot seat") or power (the executive chair or throne.) 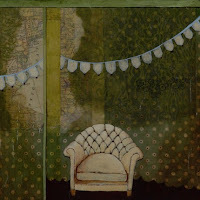 When we see empty chairs depicted in art, we tend to envision people using the chair. 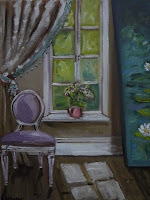 A lone chair may personify a specific individual (the ubiquitous, well-used "man chair") or evoke pleasant images of people in repose or contemplation, and in other cases pathos such as loneliness. Groupings of chairs suggest conversations or people-watching. To see up close images of these listings, click on the picture to go directly the Etsy store. Prices range from $15.00 to $550.00. Keenly observed & expertly curated, honored to be part of your Etsy Chair Art ensemble. Thank you so much, I enjoyed seeing all of them. I read your "actual" chair posting, enjoyed that and love the comparison to depicted chairs. Well written! I love the chair as the highly suggestive symbol you speak of. Well done, aesthetically too. And of course, I'm rather thrilled that you saw my chair napkin holders fit for inclusion! Thank you for the article. Thank you both for taking the time to comment. I'm delighted to feature your wonderful works. I hope you'll continue to visit EtsyLounge and chime in whenever you're inpsired! 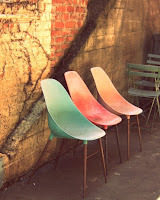 I love this well written and articulate post on chairs and enjoyed the images. I am obsessed with them, and you have hit on a couple of fun thoughts. Keep up the great work! I love this blog Andria! Thank you for including my painting! Andria and all featured artists, This is a great post as always. 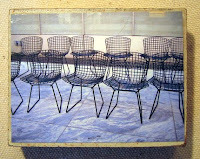 I have always been fascinated with chairs alone or with occupants. 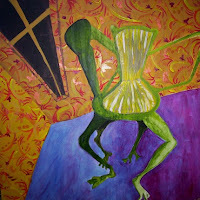 I once painted the same chair in over 20 paintings. First-everyone who sat in the chair and then the 'things' that accumulated on the chair and finally- THE chair. I was inspired! 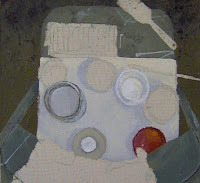 From mixed media, photography and encaustic to clay! You found some true artistic treasures here. Hope all readers visit the shops to see some more chairs.